The flurry of promotions in the wake of the non-waiver trade deadline continued into the weekend as Bobby Dalbec and Jake Cosart each headed north from Salem to Portland on Friday. Dalbec played his first game on Saturday and was 2 for 3. You can read all about his debut in Sunday's Cup of Coffee. Dalbec's debut led Sunday's top performers on MLB Pipeline as well. The same evening, Josh Ockimey and Mike Shawaryn moved up from the Sea Dogs to Pawtucket, with each earning their first appearances on Friday. 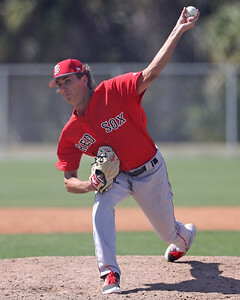 SoxProspects.com's Director of Scouting Ian Cundall was on hand to witness it, reporting that Shawaryn was solid with his slider through 6 1/3 innings and also discussed Ockimey's home run. Following his teammates down to Rhode Island on Saturday was Jantzen Witte. Between 2016 and 2017, Witte had played 180 games for the PawSox. Eduard Bazardo, who owned a 0.85 WHIP and a 56/6 K/BB in Lowell, was promoted to Greenville on Saturday and Garrett Benge was placed on the disabled list as a counter move. The Drive also sent a pair of arms up to Salem in Kutter Crawford and Denyi Reyes. Reyes has been SoxProspects.com's pitcher of the month for each of the last three months and Crawford struck out 120 batters in 112 1/3 innings for Greenville. Blake Swihart went on the disabled list with a hamstring strain on Friday and to fill his spot in Boston, Dan Butler was added to the 40-man roster and promoted to the Red Sox. The 31-year-old had not been in the major leagues since 2014. Butler was not the only minor leaguer added to the 40-man roster in order to head to the big leagues. Ian Kinsler left Friday's game and was placed on the disabled list on Saturday. Tony Renda was selected as the typical replacement Tzu-Wei Lin has been dealing with injury trouble. Dustin Pedroia was placed on the 60-day disabled list to make room for Renda. Jordan Procyshen was released on Thursday. He hit .226/.316/.278 in 38 games this year for Salem in addition to a 1-for-8 stint across two games for Portland. WEEI.com's Rob Bradford wrote an update on Boston's disabled list and revealed that Rafael Devers got through a workout without issue and will begin a rehab assignment in Lowell on Monday. In the ever-continuing Pawtucket Red Sox saga with regard to a new stadium, Minor League Baseball is seeking trademarks for the "WooSox" name according to Dan Glaun of MassLive.com, which is heightening the rumors that the team could depart Rhode Island. Glaun's colleague, Chris Cotillo, profiled Renda, who attended the same high school as Tom Brady, after he arrived in Boston. Duran (pictured, top) was promoted from Lowell to Greenville on Aug. 1 and did not miss a beat when he joined the Drive. The seventh-round pick in June's draft, Duran hit 10 for 17 in four games after his promotion with a pair of doubles. His best performance was on Sunday, when he hit 5 for 5, scoring a run to extend his 17-game hitting streak across both levels. 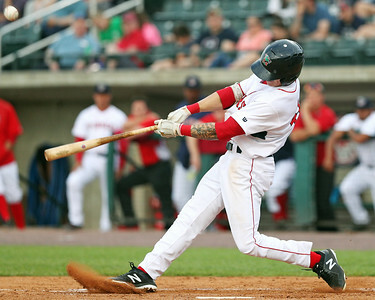 The 21-year-old owns plus-plus speed and had 10 triples in 37 games with Lowell, which leads the Red Sox system. After playing infield for Long Beach State in college, the Red Sox moved him to the outfield, where his athleticism can potentially take him places, especially if he can keep hitting. Hart (pictured, right) dealt for Portland on Thursday, shutting down Erie over seven shutout innings, which was good enough for a complete game. After allowing runners on second and third with two outs thanks to a double steal in the fourth, he retired the final 10 batters he faced while Portland's offense pulled away. It was 1-0 at the time and the Sea Dogs scored in each of their final three at-bats for a 5-0 victory. Hart, who was selected in the 19th round in 2016, split last year between Greenville and Salem, spending all of 2018 in Double-A. He gets outs by inducing ground balls, with a 40.6 percent ground ball rate and in his start, seven of the 21 outs he recorded were on groundouts with five more coming on strikeouts. He was also named Eastern League pitcher of the week.